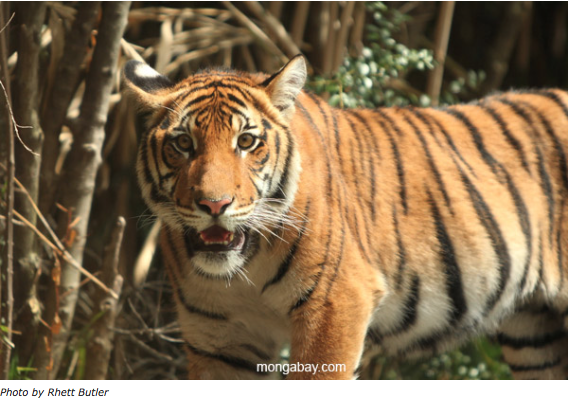 The Convention on International Trade in Endangered Species (CITES) is often hailed by scholars and conservationists as the most effective international environmental agreement. On March 3, CITES celebrates its 40th anniversary. What accounts for its success? In the following interview, CITES Secretary-General John Scanlon reflects on the convention’s strengths and weaknesses. According to Scanlon, one of CITES’s main strengths is that it’s well-drafted, with clear objectives and guidance on achieving those objectives. Further, CITES parties have done an excellent job in “filling in the blanks” over the years and created a body of resolutions and decisions that explain and guide implementation of the convention text. However, CITES still faces significant challenges. Most notably, CITES lacks its own financial mechanism for implementation. Unlike other international agreements, with CITES member states contribute their own resources for implementation. This and other aspects of the convention will be discussed at CITES 16th Conference of Parties (CoP16) which will take place in Bangkok, Thailand from March 3-14. 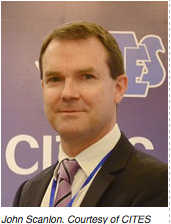 The following interview with CITES Secretary-General John Scanlon explores in depth the elephant and rhino issues on the CITES CoP16 agenda. It was transcribed by Kirstin Fagan. To listen to it in its entirety, please visit: www.laurelneme.com/wildliferadio. For more on CITES and the upcoming meeting, see: www.cites.org. Laurel Neme: Given that CITES will celebrate its 40th anniversary in March, what are some of your reflections about this convention? John Scanlon: The 40th anniversary is a good time to reflect, and to look at strengths and weaknesses, what’s worked, what hasn’t. Overall, looking back on forty years, in the context of international agreements, [CITES] has been one of the most effective, if not the most effective, international agreement, in terms of dealing with environmental issues. There are certain aspects that have been strengths to the convention, but I also think there are some areas where it’s been a bit weak and where we need to put in a little bit more effort. Laurel Neme: What are some of the strengths of CITES? John Scanlon: I think the strength of the convention is that it’s a well-drafted convention. The text of the convention is very clear. It reflects the sort of conventions that were drafted in the 1970s. They’re less framework-like, less aspirational, and much more direct. They’re quite clear in terms of what their objective is and how they’re proposing to achieve that objective. So I think one of the strengths is actually the quality of the original drafting of the text. Another strength is the manner in which the Parties [to the convention] have filled in the blanks. They have created a body of resolutions and decisions over time that have helped to give expression to the convention text. Again, they’re very clear, they’re well-crafted, they provide direction where direction was needed. Also they’ve been continually reviewed over time, so you don’t have resolutions and decisions piling up over time. They get retired. So you have a smaller, shorter list of active resolutions and decisions that are of great value to parties as they look to implement the convention. It’s a living, breathing convention, and it’s one that has been able to evolve from a good base. If the original drafting of the convention text was poor, it would have been more difficult. But the original drafting of the convention text was very strong, and you have to pay credit to the negotiators that concluded it back in March 1973; they negotiated a very good text. And then give credit to those who have sought to interpret it and implement it over time. That’s been very positive. Laurel Neme: What are some weaknesses in CITES? John Scanlon: I think there have been two areas where it’s been lacking. Firstly, it’s been so good technically and operationally that I think it lost sight of the importance of engaging politically. I think when we deal with issues of this magnitude, if you cannot adequately connect politically, you find that your resources start to dry up and it becomes more difficult to work at the operational level. I think we did disconnect from the political level in many respects, including through the secretariat, and that’s an area where we have put significant effort in the past three years, that is, to reconnect at the highest possible political level, reconnect to the political process, and to ensure that our agenda is embedded in the more significant agendas that are being considered globally. Laurel Neme: How has CITES engaged politically? John Scanlon: By way of example, for the first time CITES has been recognized in one of the World Summits on Sustainable Development. You recall we had the 1972 event where the recommendation of the [United Nations] Conference on the Human Environment [held in Stockholm] recommended concluding the negotiations for CITES. But then we had events in Rio [the UN Conference on Environment and Development (UNCED)] in 1992 and Johannesburg [World Summit on Sustainable Development (WSSD)] in 2002 where there was no reference at all made to CITES. But in 2012 in Rio [at the United Nations Conference on Sustainable Development (UNCSD], we saw paragraph 203 of ‘The Future We Want’ [the outcome document of UNCSD] reflect very clearly the importance of CITES. In fact, world leaders used language that recognized the importance of CITES, recognized it as a convention that stands at the intersection between trade, environment and development, recognized the social, economic, and environmental impacts of illicit trade in wildlife, and also recognized the importance of science [in CITES], as well as the interrelationship with people and their livelihoods. They had a very clear expression at the highest political level of the importance of the convention. And that’s a landmark statement. I was also asked to give testimony before the U.S. Foreign Relations Committee [hearing on ‘Ivory and Insecurity: The Global Implications of Poaching in Africa’ held on May 24, 2012]. [US] Secretary [of State Hillary] Clinton had an event on wildlife crime [in November 2012]. At the highest political level we’ve seen presidents or prime ministers, be it in Kenya or in Gabon or in other countries, express themselves on issues here. So, we’re starting to see a higher level of political interest, which is going to be critical. Laurel Neme: Does CITES operate like other conventions? John Scanlon: The other thing that’s interesting about CITES is that, unlike some other conventions, such as the Montreal Protocol, CITES has managed to work effectively without a financial mechanism. … We have no financial mechanism under CITES. States, developed and developing, have contributed their own resources to help implement this convention. So, there, that is a weakness, but the parties actual stood up and took measures to implement the convention. In fact, at [the upcoming meeting] CoP16 we’ll be looking at whether or not CITES should have a financial mechanism, and should the Global Environmental Facility serve as a financial mechanism for CITES. One of the other very interesting aspects of the convention, I think it’s been a great strength, is that it doesn’t operate in a typical way for the United Nations. You don’t find at our CoPs that you have [voting blocs like] the G77 [Group of 77, a caucus organization that helps developing states pursue common goals and develop leverage in United Nations deliberations] and WEOG [Western European and Others Group is one of the unofficial regional groups in the United Nations that acts as a voting bloc]. What you find here [at CITES] is that it’s a bit more like a conscience vote in a parliament, or a congress, or a diet, where states vote freely on issues, depending on how they choose to go. You will find the African continent has a difference of opinion with certain issues to do with ivory trade. You see China and the United States putting forward joint proposals for listing. You see Latin American states, European states, and North African states coming together to propose listings. You see a convention that is much more pragmatic, not operating on the traditional-type UN negotiations, where you see countries from developed, developing, states in transition, all working together on different proposals in the interest of survival of species in the wild. So I think there are some interesting, distinguishing characteristics of the convention, strengths and weaknesses, and I think at this forthcoming CoP we’ll have the chance to address these issues and others. Laurel Neme: Since you’ve been the Secretary General of CITES, what are some of the changes you’ve emphasized, particularly with respect to international cooperation and trying to establish a financing mechanism? John Scanlon: I think that one of the interesting aspects of the convention is when it was originally negotiated, the predecessor to the World Trade Organization, the GATT [General Agreement on Tariffs and Trade], actually participated in the negotiations, as did the FAO [Food and Agricultural Organization of the United Nations]. So, given [that CITES is] a convention that deals with trade, you saw others be engaged in it. Given it has an interest in how you deal with both legal and illegal trade, it is engaged with institutions with an enforcement mandate. I think the interesting thing is that we saw the convention engage but we saw the convention not engaging as deeply as it needed to in order to ensure the most effective implementation of the convention. What we’ve seen over the past few years is deepening the engagement in some cases, or reestablishing the engagement that had perhaps lapsed over time with others. So we engage with the non-government sector, with international organizations, within and outside the UN, and obviously with all of our parties, who are the owners of the convention. What we’re doing on the enforcement side, having brought in place this consortium, we now have very deep engagement with those agencies within the system, be they UN or non UN, that are primarily charged with dealing with enforcement issues, [like] Interpol, UN Office on Drugs and Crime [UNODC], World Customs Organization, and World Bank, in terms of the work done on money laundering. We’re now deeply embedded within the work programs of those particular institutions, and they are taking up the CITES agenda as their own agenda, which is a significant change. We’ve seen resolutions of all of those institutions, in particular World Customs, Interpol, and UNODC, over the past few years embedding CITES-related issues into their own agendas. But we’re also seeing that happen with Amazon Cooperation Treaty Organization, which has built CITES into its own strategic plan, as has the Pacific Regional Environment Programme. We’ve deepened our engagement with UNEP [United Nations Environment Programme]. We’ve also deepened our engagement with traditional partners like IUCN, which has done a lot of work with us on issues to do with the science behind listings. We’ve deepened the engagement with TRAFFIC through ETIS [Elephant Trade Information System]. We’ve deepened the engagement with other partners; we’ve worked right across the board. I personally met with a whole raft of groups in the non-government sector, be they come from animal rights, animal welfare, conservation, sustainable use perspective, because we have a wide suite of interests in the convention. I think we are a convention that engages very deeply within and across intergovernmental, international, and national entities, be they government or non-government. And that is a great strength of the convention. But we need to reinvigorate in some cases, create it in others, or further entrench it in some cases.